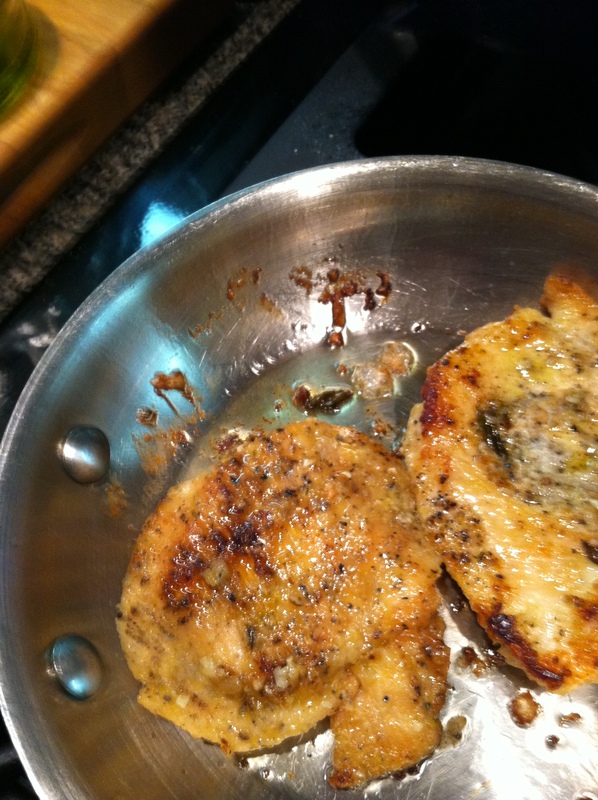 This is a simple delicious recipe for Chicken Piccata. It is fresh and light and cooks quickly. Boil the water and cook pasta while making the piccata. You can choose to use tofu or fish or scaloppini of veal instead of chicken. We like them all! Place the sliced chicken breasts into a plastic bag, a piece at a time, and lightly pound to make the breast pieces flat and even. Heat a saute pan over medium high heat, when hot add the oil. Dredge the pounded chicken breasts in flour. Saute in a hot saute pan until golden brown on both sides. Remove the chicken from the pan and keep warm while you make the sauce. Add the shallots and garlic, stir, being careful not to burn the garlic or shallots. De-glaze the pan with white wine. 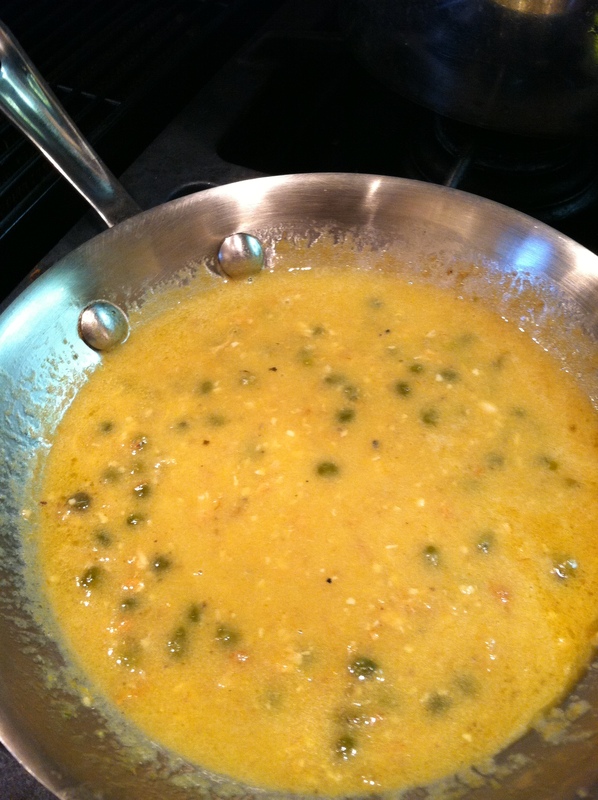 When the wine is nearly gone, add the lemon zest and juice, capers and chicken stock. Bring to a boil. Simmer for 2-3 minutes. Whisk in the butter and serve. Do not boil the sauce after adding the butter to avoid ‘breaking’ the sauce. Serve with spaghetti, linguine or rice, if you prefer. A fresh green salad and crusty bread are great sides. This entry was posted in Recipes and tagged Chicken, chicken breasts, Chicken Piccata, dinner, food, lemon zest, Picatta, Piccata, recipe for chicken piccata, Sautéing. Bookmark the permalink. Yes, you certainly could make this! 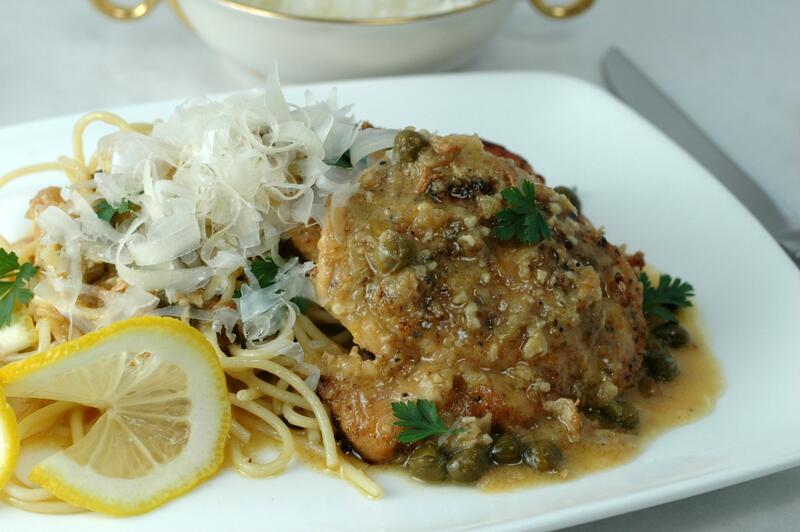 This looks so delicious – I’ve never even had chicken piccata! It is so good! Super easy, too. I hope you try it. if you do, please let me know what you think. Here is another secret: if your sauce isn’t as thick as you’d like, add a tablespoon of smooth Dijon mustard. 😉 It adds another dimension to the flavor palate, making taste more complex on several levels. It is delicious and so much better than any I’ve had in a restaurant! What a lucky guy I am. I love chicken piccata and your finished dish is beautiful. Thank you! It is one of our favorites too. I love chicken piccata! Looks like a great recipe and easy to prepare – what could be better! It would be amazing with one of your pastas too! Ciao bella. I am not great on chicken but this makes me feel like I want to eat the screen. Thank you for the tutorial and the inspiration. I am sooo going to bookmark this. I usually butterfly chicken breast, coat it in flour and lightly fry it with lemmon, but I never used the sauce you describe -which reminds me of “a la meuniere”- for chicken, only for fish. I think it looks amazing on that piece of chicken. Brava. Yes, the sauces are very similar. and delicious on fish too.